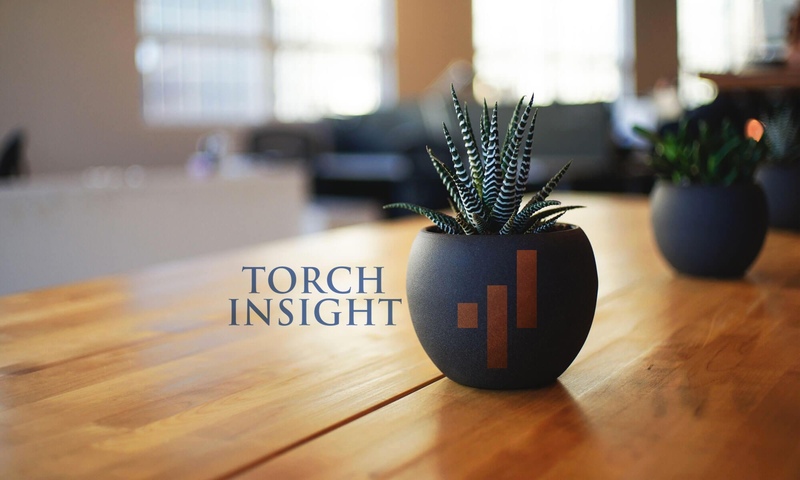 Torch Insight is designed to help evaluate and analyze healthcare markets and organizations. There are countless analyses that can be performed, focusing on demographics, financials, performance, quality measures and many, many other pieces of information. For this demonstration, I will focus on a chronic condition that is pervasive across America: Alzheimer’s disease. The goal is to show one approach to performing a preliminary market-level analysis of a disease. Alzheimer’s disease is the most common form of dementia that affects over 5 million Americans, the vast majority over the age of 65. It’s a progressive illness that causes mental decline including causing difficulty with thinking, reasoning and remembering. As a country, America spends hundreds of billions of dollars a year on direct care. The impact of the disease is not uniform around the country. Using Torch Insight, we can start to visualize the differences. Torch Insight has both market-level data and organizational-level data (such as information about physicians, hospitals, insurance companies, etc.). For this example, I’m focusing on the market-level prevalence of Alzheimer’s. 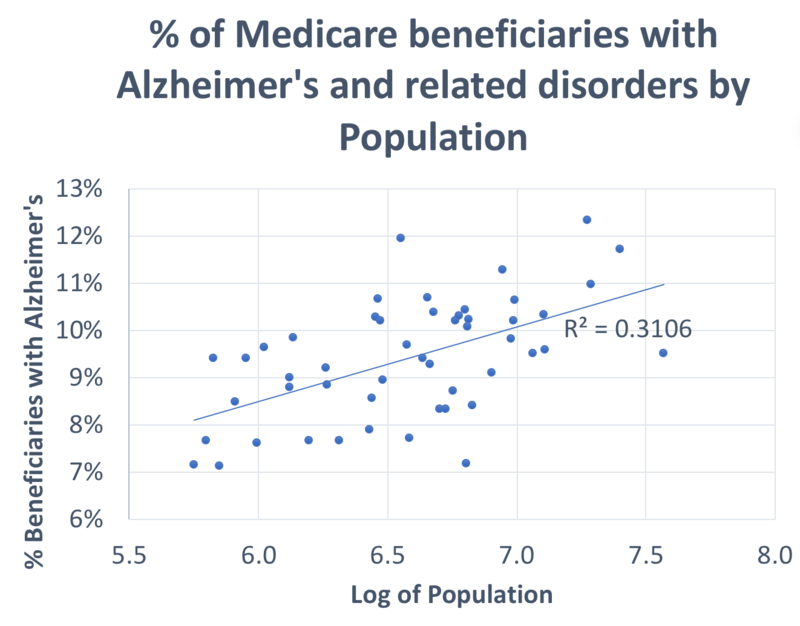 Since Alzheimer’s primarily affects those that are on Medicare (those aged 65 and older or those that with a disability – including Alzheimer’s disease – that qualifies them for supplemental security income), Medicare data is a great resource to assess the prevalence of the disease. Medicare is a government-backed health insurance program and collects massive amounts of information based on enrollment information and the claims it pays on behalf of beneficiaries. Some of this data is then released in a variety of public use files (PUFs) and limited use files. The prevalence of Alzheimer’s in the Medicare population comes from the 2015 Medicare Geographic Variation PUF, which is prepared by the Centers for Medicare & Medicaid Services (CMS). This file provides a variety of pre-tabulated fields, including data at the state- and county-level. While I’m demonstrating this data based on the pre-tabulated data, we’ve also calculated it directly from Medicare claims data. In the following map you see the percent of Medicare beneficiaries that have Alzheimer’s or a related disorder, by state. The map is interactive and you can zoom, scroll and hover over the individual states to see values. You can see that the percent of the Medicare population with these dementia-related illnesses ranges from a low of around 7% to a high of around 12%. For states that are providing services for these patients, either through social services or through Medicaid for those that are dually eligible for Medicare and Medicaid, the prevalence can make a significant impact to the state budget. (1) The disease visually appears to be more prevalent in states with larger populations (Florida, Texas, New York, California, etc.) and I wonder if there’s a correlation? 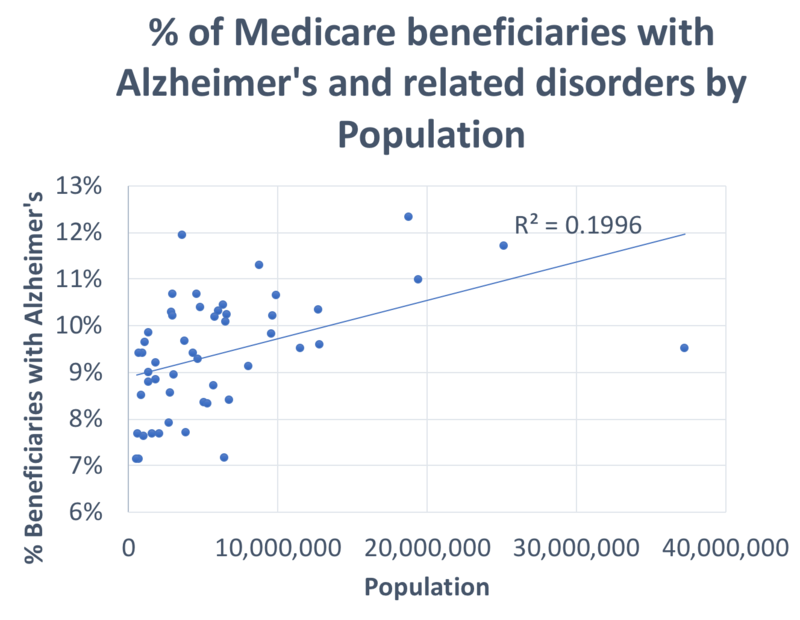 (2) I know that Alzheimer’s is an expensive disease, so I wonder if an increased prevalence of Alzheimer’s is associated with higher Medicare costs? (3) I wonder if the variation at the state level is similar to the variation at smaller geographies. The first two questions will require a little more data. Luckily, Torch Insight has hundreds of pre-built, healthcare-related variables so I can select a few that are interesting. The R2 is nearly 0.2, which, is modestly explanatory for a single variable looking at a linear relationship. There are a few states that are outliers with population, so I transformed the population and took the log of it and the R2 went up to 0.31 – decently explanatory. This means that not only are states with higher populations more likely to have more total Alzheimer’s patients, but they are more likely to have a higher prevalence of Alzheimer’s patients. When comparing costs, it’s important to think through what costs are important. Medicare provides a variety of cost numbers in the PUF file, including total and per-beneficiary costs, as well as costs that are standardized (meaning they adjust for different prices that are paid in different regions of the country) and risk-adjusted. Since risk-adjusted costs account for the prevalence of different diseases, I will use state-average, standardized annual costs per Medicare beneficiary. This time the correlation is really strong (corr=0.781,p<.0001). The only outlier with low costs and high prevalence of Alzheimer’s is Hawaii, which may partly be explained by how costs are standardized with Hawaii. 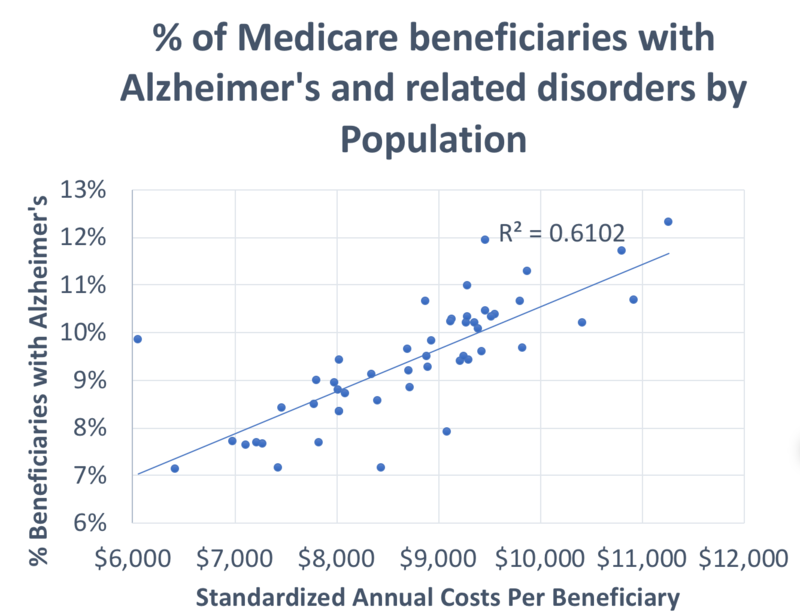 I can confidently say that a high prevalence of Alzheimer’s disease within a state is associated with higher total Medicare costs. While state-level analyses are interesting, it’s often valuable to drill down to a smaller geographic level. Torch Insight includes states, hospital referral regions, metropolitan areas, congressional districts and counties as options to dig deeper within the visual interface. I just selected the state with the highest prevalence of Alzheimer’s – Florida – and included the county-level map. The prevalence of the disease ranges from 7% (not much higher than the best states) to 21% in Miami-Dade county. Not only is that a huge difference, but the highest prevalence is in the most populous county, which drives up the state average. Similar to the previous analyses, the prevalence of the disease at the county-level in Florida is strongly associated with population (corr=0.655, p<.0001) and costs (corr=0.627, p<.0001). My goal with this was not to explain what’s driving the spread of Alzheimer’s Disease and other forms of dementia or to do any sort of a causal assessment. Hopefully, you were able to see the power of being able to quickly combine market-level characteristics and see how you can dig into the variation that exists. Hopefully, also, this raises questions in your mind about Alzheimer’s disease – it certainly does for me and there are multiple avenues of further inquiry I could perform (How does its prevalence relate to other chronic diseases? What other diseases are as predictive of total Medicare costs? Why might there be a higher prevalence of Alzheimer’s disease in higher population areas and larger cities? And many more). The joy of data exploration is that there is always more to learn and Torch Insight can accelerate that learning. Torch Insight™ is a health care database and analytics platform that provides the most comprehensive and accurate data on the unique attributes of ACOs, bundle payments, hospitals, physician groups, insurance carriers, and more. Torch brings together decades of Leavitt Partners health care policy expertise and consulting experience. Our team has integrated and linked 2,000+ variables from dozens of public and proprietary data sources, allowing you to quickly answer complex questions that traditional data resources can’t answer on their own.